Wildlife and humans don’t always get along. We can’t communicate, so it’s hard to tell what the other is thinking. Some people are special and seem to share a unique bond with animals, proving that we can and do understand each other on some sort of level. For this whale, it was this relationship between animal and human that saved its life. James Moskito is a volunteer and a professional diver who happened to come across a humpback whale in trouble in December of 2005. 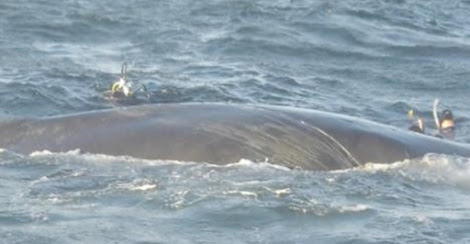 Him and his crew of volunteers were working to free the trapped whale off the coast of San Francisco, California. 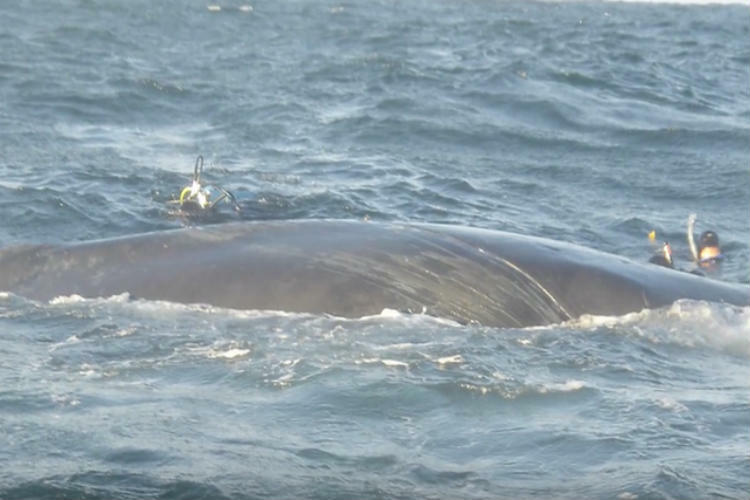 The poor whale was tangled in ropes that were attached to a 3,000-pound anchor! During the rescue procedure, which took about five hours, Moskito noted how “cooperative” the whale was. He said the whale was looking at him and knew what he was doing. “Some of the individual ropes went into the blubber two or three inches deep. I put my hand on the whale and I told the whale, ‘Okay. This is gonna hurt.’ The whale was so cooperative, it would open its mouth and a guy would put his hand up inside of it and pull pieces of rope out of the baleen, one by one,” Moskito said. After the crew worked hours to free the whale, it stayed with them afterwards, even rubbing up against them! The whale dove back underwater to just come back and personally thank Moskito in its own way. It came up and immediately rubbed up against Moskito, as if it knew what he had done for it. Watch the video below for yourself and tell us what you think of this touching story in the comments below!